Now that 2016 has come to an end, I want to express my gratitude to all of my clients who have supported me in this critical first year as an independent California business. Some of you are long-time clients that have been with me since the early days of CinemaTechnic, Inc. of Miami, as far back as 2001. I’m very glad to have you back. Some of you are new clients and trusted me with your cine lenses. I’m pleased to get the job done for you, sometimes in shorter time frames than anyone else could provide, making sure your lenses were in top shape and ready when you needed them. Know that I work on your lenses with as much care as if I owned them myself. I was once a cine camera and lens owner-operator and I know how much you invest in and depend on your equipment. I was surprised by the amount of film camera service business I got in 2016. Although it is a small part of my business it still exceeded expectations. Big things are in store for CinemaTechnic, LLC in 2017. We have outgrown our tiny Hollywood office and will be moving to a much larger space in Burbank in January 2017! The new space opens up a lot of possibilities. I will be able to set up my precision metalworking and prototyping area, which will allow me to get involved in modification and development projects. 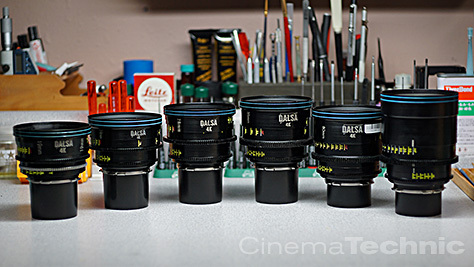 The photo above which shows a set of super-rare Dasla 4k Digital Cine Primes (rehoused Leica-R’s), one of my most interesting service jobs of 2016. Thank you and best wishes for 2017! CinemaTechnic is pleased to announce the limited availability of Super 16 / 2k Digital Cine conversion for the Zeiss Vario-Sonnar 1.8/10-100 T2. We have found a source for a few new old stock conversion kits. These kits were thought to be unavailable since the late 2005 demise of Optex. Zeiss designed the f1.8 Vario-Sonnar 10:1 zoom for regular 16mm. These lenses were produced beginning in the early 1980’s. That was many years before the Super 16 format became popular. 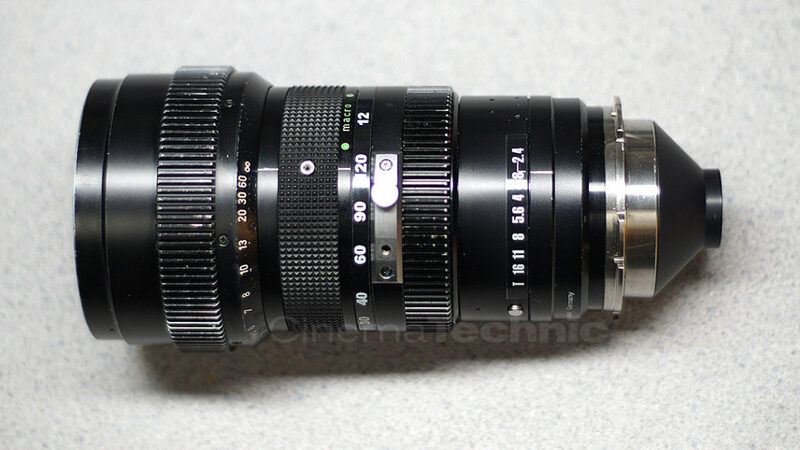 This lens, produced in substantial numbers as a companion to the Arriflex 16SRII, won’t cover Super 16 or 2k digital. In order to cover Super 16 and 2k digital cine formats, the minimum image circle has to be increased by 20%. This can only be done with additional optics, which are positioned just behind the lens’ original rear element. These new optics follow the Barlow lens principle and increase the image circle diameter by 20%. The lens above was converted with one of these new kits. The conversion optics are nicely integrated into the included PL mount. This is a great value. PL mount option for the original Optex kits was $650.- just for the mount! Your lens will receive a new group of high-quality multi-coated optics that will get mounted just behind the original rear relay optics. You can see the housing for these optics integrated in the black cone of the PL mount. The conversion optics are made by a world-class company specializing in optics for scientific research an industry. They are the original designers for the Optex Super 16 conversion kits. They also designed Optex’s renowned line of Super 16 prime lenses. You can be assured that your lens will be converted without compromise, maintaining the original optical quality the Zeiss Vario-Sonnar zoom is known for. After conversion, the lens becomes a 12-120mm T2.4 and covers Super 16 at all focal lengths and focus distances greater than 5 feet. The increased coverage is important for 2k shooters as it ensures coverage of all 2k windowed modes on Super 35 sized sensors. Also sensors such as the Blackmagic Pocket Cinema Camera which has a sensor slightly larger than Super 16 film, are covered. Cost for the conversion is $2147.- including PL mount, standard installation and calibration at our facility in Hollywood, CA. NOTE: In response to questions from many 2k digital users: The Zeiss 10-100mm T2 is the only 16mm lens that can currently be converted to Super 16. The conversion for the Cooke 9-50mm T2.5 is no longer available (one of my customers got the last one years ago). There are no other conversions available now or in the past. Frustrated by the hunt for good quality used cine lenses for your digital cine 2k 4k or 6k camera? 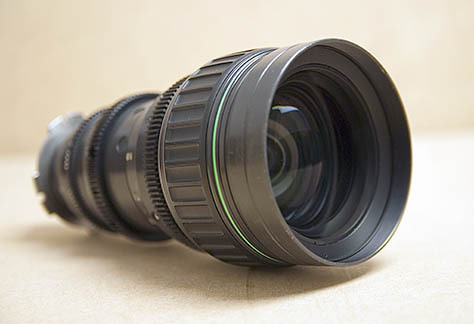 Check out our used cine lens page new inventory and updated pricing. We have some lenses available that are rarely available on the used market, such as the Optex/Canon L 300mm T2.8, the Canon 11-165mm T2.5 and the Cooke S4 6.0mm 9.5mm and 12mm. Also available Zeiss Distagon 9.5mm T1.3, Zeiss Mutar 0.6x “Aspheron” Wide Angle Attachment and Zeiss Vario-Sonnar 11-110mm T2.2 Mk.3. All lenses are inspected prior to sale, serviced as needed, and focus adjustments are covered for the first 180 days. I have all the proper tools, supplies (lubricants, etc.) and service documentation for the above camera models. Labor rate for film camera service is the same as for cine lens service $125.- per hour. There is a 1.5 hour minimum for the first time inspection/test and estimate on a particular ARRI/Moviecam film camera. The minimum is waived if the same camera returns for follow-up service. Spare parts availability is very limited. New spare parts are not available from the manufacturer for any of the cameras listed above. If parts are needed for repair, I will utilize my resources to find the needed parts. A research fee may be charged for time spent sourcing parts. Owners should expect delays in service. For this reason it is very important to schedule service well ahead of any potential shoot dates. I have also been hearing about the difficulty in finding ARRI film camera accessories. Many new owners purchased their camera packages on auction sites and are missing important accessories. Although the cameras themselves are not difficult to find on the used market, accessories are another matter. Availability is limited and prices have started to go up for the first time in several years. I have updated my film camera accessories page to reflect what I have available. 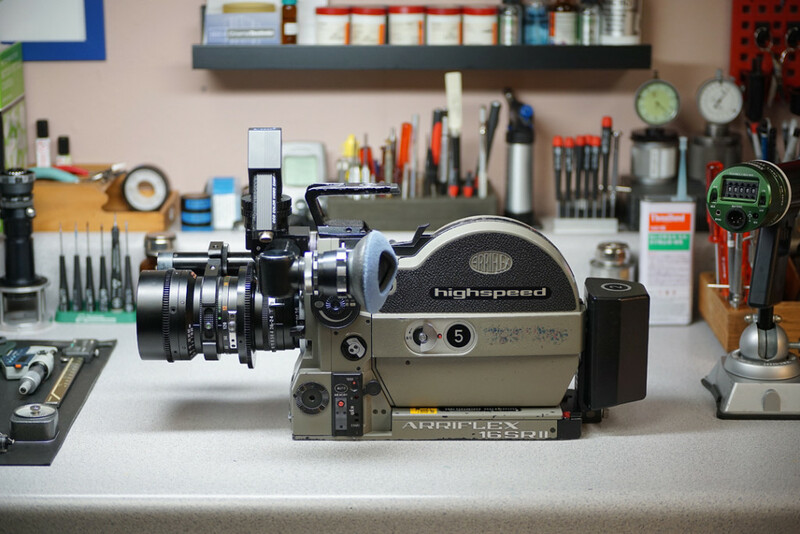 Please don’t hesitate to get in touch for your film camera needs. Here’s a view of the main workbench at the new workshop at CinemaTechnic Hollywood. 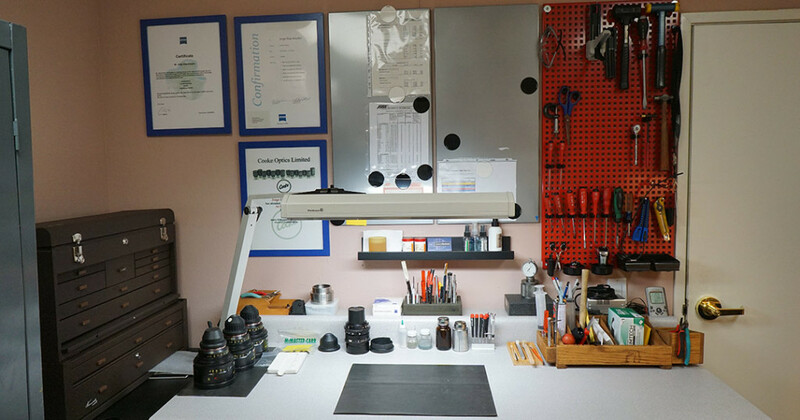 The new shop is finished and ready for your lens repair jobs. 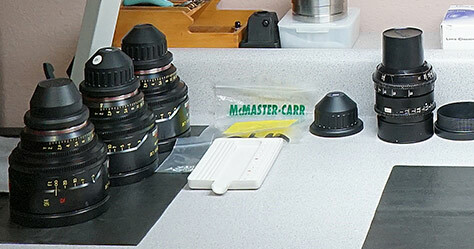 Can you guess what lenses are on my bench? Hint: the ones on the left side are quite rare. The one in the center is a mainstay of the industry. 2016 seems to be shaping up as an evolutionary year for the cine equipment business – which is not, in my opinion, a bad thing. I feel that history of the evolution of motion picture technology shows that there are revolutionary periods where many significant new technologies get introduced within a short period of time. This happened most recently between 2007-2010, and prior to that in 1972-1974 (hand-holdable silent 35mm cameras), and 1952-1954 (Cinema, CinemaScope, 3D) and 1927-1930 (sound-on-film). In each case, new technologies get introduced, and filmmakers don’t have time to determine the best way to use them. In some cases the new technologies affect the filmmaking process negatively. Think of the early talkies (early 1930’s) where there was zero camera movement – because the noisy camera was encased, along with its operator, in a sound-proof booth the size of a phone booth. Or more recently the early CinemaScope films that were shot like stage plays using one big wide master shot – because the early anamorphic adapters had too much distortion to be used in a close-up. During the revolutionary periods the equipment manufacturers and film producers also get confused not knowing which technology to back. Think of the early color processes, early 1950’s 3D technology, or the short lived small-sensor HDTV based era of digital cinema. In each case, once there are several years without any really disruptive technologies being introduced, filmmakers and procedures have time to figure out how to best use the new tools, and manufacturers have time to sort things out as well. I think that after a few years of a very furious pace of introduction of new technology, we are entering a period where cinema technology is maturing. It’s been 10 years since the first time I attended NAB in April 2006. I had arrived at an inflection point for the motion picture camera industry – even though I did not realize it at the time. That year ARRI introduced the ARRI 416, their first completly new Super 16 film camera in 30 years. Super 16 was super-hot at the time. But few realized what was coming. The 416 would be the last ever ARRI film camera to be developed. It would have a short production run, unlike it’s predecessor the 16SR, which was in production for 30 years and 5100 camera bodies in all it’s variations. The rest is cinema history. Nothing would ever be the same again. I’m here again at NAB 2016. It will be interesting to see not only what’s new this year, but to consider the perspective of how much things have changed in the last 10 years. I’ve started to bring the content from the old CinemaTechnic.com server over to the new site and adapting it to the new CMS system. Please bear with me while I sort everything out. I’m aware that there are a lot of bad links and that the old html tables are hopelessly broken. Cinematechnic.com has been around for over 15 years and there is a lot of legacy content. Even after deleting some pages that were no longer needed, the site is still over 100 pages! I know the menus are a jumbled, but I’d rather leave it up in its unorganized state for now since at least that provides a way to access the content. Thanks for stopping by… You are among the first to see the new CinemaTechnic.com on its new server and CMS platform. Don’t worry – all the information from the old cinematechnic.com site will be coming back online over the next several days. I regret the downtime but it’s part of the process of modernizing this site. The original cinematechnic.com home page was created on 3 December 2000. The web has changed so much since then, and the old site was running on legacy code – most of it HTML 4.0 – woefully out of date. Incremental updates to those old pages just wasn’t getting the job done. Sometimes you have to start over from scratch. New and exciting things are in store. Be sure to check in soon.